Today's market demands include higher strength steels, more complex parts and shorter turnarounds along with the capability to form smaller lots of different part types. Instead of investing in multiple machines, Seyi's two-point Straightside Direct Drive Servo press can handle all of these requirements and more. Limitless programmability for stroke, speed and dwell times are just a few of the advantages that equip you with the tools you need to be competitive in today's dynamic marketplace. 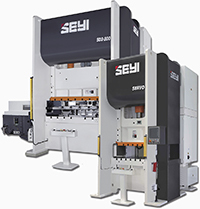 The Seyi servo press features a high-torque low-RPM servo motor, high-strength construction, two-connection large bed size, eight preprogrammed profiles along with freeform motion and electronic overload protection.